You can never have enough clamps. But then again, having just the right woodworking clamp for the job can make a huge difference. 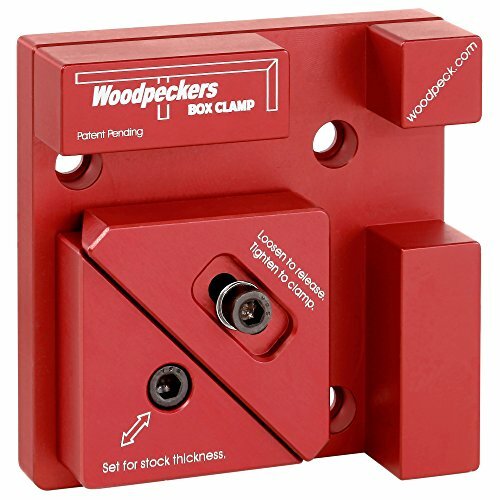 The new Woodpeckers 4" Box Clamp might just be the perfect clamp for assembling your cabinets, drawers and virtually any other box made from 1/4" to 1" thick material even with two pieces of different thickness (up to 1/4" difference). Its unique space-saving design actually gives you more surface area than most similar corner clamps while not having any clumsy, protruding handles or screws. The Box Clamp was designed to take up the least amount of space while offering more, dead-true clamping surface then other comparable woodworking clamps. It can be used as part of a clamping fixture for assembly of multiple, identical assemblies or unfixtured for large cumbersome projects. Most mass-produced woodworking clamps are stamped, molded or die-cast distant cousins from the precise proto-types they started out as. Not here. We carefully machine each and every clamp from a solid billet of stress-relieved aluminum to ensure dead-square accuracy in each and every direction so every woodworking clamp is as perfect as the last one. You'll find the Woodpecker Box Clamp to be at least as precise as your high-end layout square and robust enough to deliver a lifetime of consistently reliable service. The secret to its compact functionality is its tapered wedge design, (only one moving part), that simultaneously pushes the mating materials down and in with less than two turns of the screw while applying an enormous amount of clamping force. Even just one Box Clamp will save you time and aggravation as it instantly squares up your pieces and holds them in place for gluing, screwing or nailing. Each Woodpecker 4" Box Clamp is machined in our own shop just outside Cleveland, Ohio.